A hybrid finite-discrete element method is introduced to simulate dynamic fracture of rock and resultant fragment arching caused by rock blast. Three typical examples, i.e. blast in a rock mass with a single borehole and a free surface, simultaneous blast, and consecutive blast with various delay times, are modelled and the obtained stress wave propagation, fracture process and resultant fragment movement are compared with those well documented in literatures. 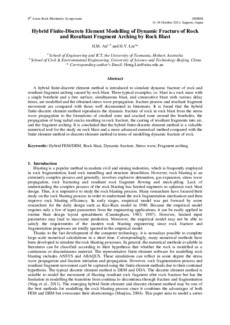 It is found that the hybrid finite-discrete element method reproduces the dynamic fracture of rock in rock blast from the stress wave propagation to the formations of crushed zone and cracked zone around the boreholes, the propagation of long radial cracks resulting in rock fracture, the casting of resultant fragments into air, and the fragment arching. It is concluded that the hybrid finite-discrete element method is a valuable numerical tool for the study on rock blast and a more advanced numerical method compared with the finite element method or discrete element method in terms of modelling dynamic fracture of rock.